If you want the most divisive topic in the hobby, don’t worry about live feeding or grotesque hybrids. No, if you fancy bringing out the worst of fishkeeper rage, talk about your nano tank. On the one hand, I can kind of see what the issue is. The problem is that the accessibility of the nano tank, to a fresh and inexperienced field of fishy newcomers is asking for trouble. It’s kind of like me suddenly mass-producing a Formula one car that does 0-120mph in three seconds for £500 and aiming it at first time drivers. It’s going to end badly for someone. But just woah there, Sebastian Vettel. That’s not to say that nano tanks are an awful idea. It might be that they aren’t suited for everyone, but that doesn’t mean the concept itself is necessarily bad. In fact, even to say they’re not suited to everyone is a little, well, snobbish. A little bit elitist. Anyone can keep a nano tank, provided that they get the information that they need to make it work. I’m sensing some retailers looking at their feet and shuffling here. Look me in the eyes, I’m not letting you off the hook. 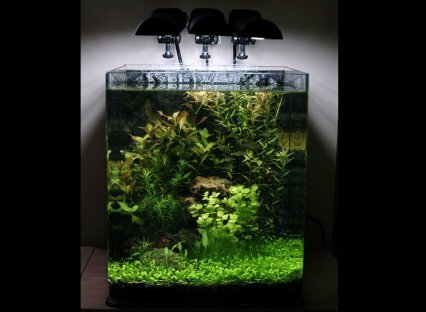 The fact is, there are a lot of nano tanks out there that not only work, but work well. If I’m going to lay my cards on the table, some of the nanos I’ve witnessed are considerably better run and with healthier fish than in some of the larger tanks owned by the fiercest of nano denigrators. If I had to lay down one good reason not to hate the nano, it would be this. They very possibly saved this industry when it was starting to get pushed to its knees. There’s no shame in admitting that for many, the financial pinch was taking hold, and that it was getting increasingly difficult to push larger set ups to potential aquarists, at every increasing prices. The nano came along, increasing in popularity as more and more retailers saw the potential of a smaller system, and it provided a steady stream of income for many shops. And you know what else? It introduced a whole lot of fresh blood to the hobby. Fresh blood that now has larger, more elaborate tanks. Of course, the downside to this miniature explosion was that also of terrible practices, but not practices that weren’t around in the first place. On the one hand, I point a stern finger at manufacturers of said tanks. Why on earth are we still seeing images of entirely unsuitable long-term fish on nano tank packaging? Goldfish in 25 l/5.5 gal of water? Did someone breed the 3cm pygmy Oranda in my absence? On the other hand, I blame the naivety of some new fishkeepers – with a little hint of angst at the retailers that sold them the set up. This, I suspect is a barrier we will always face in any area of fishkeeping. There are those chaps that view fish as an organism experiencing a life, with needs to be catered for. And then there’s the novelty crowd. But as I’ve said, this is no new phenomenon. There has always been, and likely always shall be, that aspect of keeping that views livestock as a commodity. I doubt in my lifetime I will see the end of shovel nosed cats in four foot tanks, as much as I’ll see the end of fancy goldfish being placed into a 30 l/6.6 gal cube. It is, alas, the nature of the beast, and short of a new world ethic viewing fish in a different light, I fear it is here to stay. So what would some do to cure this? Well, in their ideal world where nothing is at risk, no tank below a certain size would be sold. Likewise, no fish capable of attaining a certain size would be sold. But that would be a terrible shame, and an affront to those responsible keepers who do things properly. There are people out there with colossal tanks and indoor ponds that can keep a large cat happy. A minority, yes, but they’re out there. By the same standard, there are those who can keep a nano tank, and all of its inhabitants happy. Should we punish them because there are others that can’t do what they can? The abolition of the nano tank may have a credible argument for it, but I’ve yet to hear it. Some countries have already opted to place minimum sizes on aquaria sold. In Rome, Goldfish bowls have been illegal to buy since 2006. But then, a goldfish bowl and a modern, filtered nano tank are as separate as a horse cart and a Honda Civic. Yay to no more goldfish bowls. I’d be more worried if they said no to a filtered 40 l/8.8 gal system, though. Some people simply say that nano tanks are too small for fish. But let’s go head to head here, like for like. How about a nano tank. We’ll call it 45cm/18" long, 30cm/12" wide, and 25cm/10" tall. That gives me 33.75 l/7.5 gal capacity. Let’s lose 10%-ish for gravel and gumph, and I’m down to 30 l/6.6 gal. That wouldn’t be amazing for many fish. Goldfish are off the menu, for sure. I wouldn’t even fancy trying something like a Ram cichlid in there. Personally I’d opt for a brace of little Boraras brigittae, the Chilli rasbora. What’s the maximum size on one of those? 18mm/0.7", as I recall. So that gives me a fish with 25 times its own body length of space to swim along. So how about a bigger fish, such as a nano baiter might have in a larger home. How about something like a Firemouth cichlid, Thorichthys meeki? Those little tykes can reach about 17cm/6.8" fully grown. What would we need tank wise to appropriate a similar space for them? Let's see, 17cm x 25 times body length. That equates to a tank of 425cm/170". So, if you’re a Firemouth keeper and your fish isn’t in a tank of over four metres, then you can get off your high seahorse. Of course, you can argue that Firemouths move about less. Some would argue the old six times rule, and that would mean that for a typically sized (say 15cm/6") Firemouth, a 90cm/36" tank is adequate. But then if you’re using the six times rule in your defence, then you need to be careful about having a pop at a tank that’s applying a 25 times rule. You can see where I’m going with this. Like for like on sizes and ratios, there’s an awful lot of hypocrisy out there. I can already hear the cries and wailings of my critics. It’s about water quality, they’ll insist. It’s about water stability. Well, a better point, yes, but I still remind that things have moved a long way since the days of the simple air driven foam filter. We now have nanos that hold three stages of media, biological, chemical and mechanical. Once established, I’d require some convincing that one of these filters, in the right hands, is any easier to wipe out through a powercut or inappropriate cleaning than an internal canister on a three-footer. Heck, size for size, many of these nano filters work out bigger on a to-volume ratio than giant external canister on big display tanks. Water volume? More water can hold temperature longer, for sure. But to suspect that a larger tank with large, messy Oscars has any better dilution ability than my nano with six Chilli rasbora is a brave claim. But what about outside pollutants like air fresheners? Won’t they have a more concentrate effect on a nano than a large tank? Yes, yes they will. But that’s not the fault of the nano, that’s the fault of the keeper. Read back to what I alluded to earlier, where I hinted about fishkeepers needing to be armed with the right amount of information. But I digress. I am a snob. I suspect that nano tanks aren’t for everyone. I think that the family wanting to take a 15 l/3.3 gal tank for a kid’s bedroom, and fill it with Mollies should be denied that transaction. But I think that keen enthusiast, strapped for space and money, and desperate to embark on that Paedocypris project they’ve been dreaming up should be embraced into the hobby with our blessing. It might be beyond your own means, but don’t automatically assume it’s beyond everyone else’s too.